Anyone reading this book will need to know that you cannot come out of the experience as you went in—you will be awakened, you will become aware—or as the newest generation says—you’ll be woke. Even if you are of a like mind, even if you believe you are a tree-hugger (Chipko Movement tree hugger variety, not the fashionable onlooker with seemingly good intentions), this book, with thousands of examples, with clear, heart-warming and heart-stopping examples—this book will connect the dots, around the world and, indeed, into deep space with what it means to be part of a whole: good, bad, ugly, and beautiful. Some may think the book revolutionary. It is not. Trebbe Johnson brilliantly seeks out, explores, exposes hundreds of time-worn, sometimes mythical, tales, and then she does something painstakingly awesome: she explores connections. She is not merely content to cite examples of tasks we observe. She is not merely a chronicler of events she has witnessed or others relate (and has excellent references at the end). What she does is take these threads, then weave them into a tapestry, one chapter, one theme at a time, to allow the reader to experience the whole. In many ways, her approach is like Tony Hiss’s wonderful The Experience of Place—allowing the reader to understand, place the reader in context, and then trust the reader (through excellent prose) to turn pages in absorption of the underlying message. What’s the underlying message in this book? 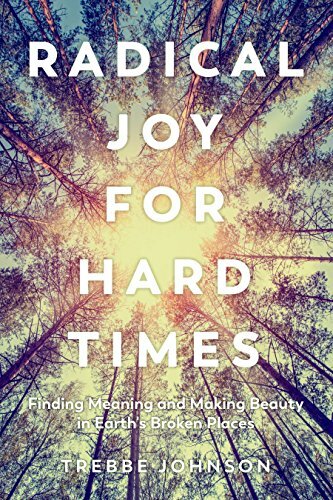 You can find joy in the world especially in hard times, in hard places, in hard events. Truth can be beauty if, and only if, you can absorb the entirety of what you see, hear and feel, making it personal and, by so doing, allow yourself the vulnerability to alter the impact such events have upon you. In the book, she also cites an example of an action I myself have taken. At JPL (and at JSC) there is an image posted taken by Voyager 1 looking back at Earth. It appears in the vastness of our own solar system as only a dot. I, like the others she cites, touch that dot when we see that image. Connection. “No wonder they left their fingerprints all over it. The urge to get intimate with the world . . . is a facility that awakens in infants and never leaves us.” As a guide, she says she is surprised that people she takes into nature find inner truth, even in places ravaged by fire or destruction. Yet that same curiosity and need to connect—once awakened by the different, the new—bring out the infant in us all. So, you may ask, what solutions does the author propose? Sound ones. A sponsoring the Global Earth Exchange, inviting people from all over the world to discuss, share, explore, and, finally and most importantly, make a gift of beauty to the place they were in—this process allowed a new Chipko Movement-type moment, a real, true spiritual path to be established. Then the author took it one giant leap forward, issuing herself and others a challenge. “The practice of giving a gift of beauty to a wounded place subtly, yet fundamentally, changes my relationship with the place . . .” she found a means to heal herself of the horror seen, perhaps beautify that which had been abandoned or destroyed, and certainly connect herself with the reality—but always refresh a realty now seen with beautiful, truthful, eyes, not sordid or blind ones. She wants the reader to see the joy of life, see past (not overlooking, but first absorb, understand, and then see past), to find that which brings joy to the inner self.